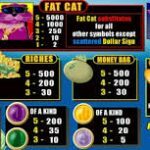 A group of wealthy cats is gathered together for the latest Nextgen Gaming video slot game, Fat Cat. If you have ever wondered what would cats do if they had their hands on untold riches you are about to find out. Maybe they are ready to share some with you as well. In the background of the game there is a huge pile of cash and the reels are placed on a mountain with gold. What a view! The Fat Cat is the wild and its function is to stand in for every other symbol except for the scatter. It is also the key to the bonus round all you have to do is to land the symbol on the first and the fifth reel at the same time. Be prepared to win multipliers that go up to x5 and win up to 500 times your triggering bet in this bonus round. 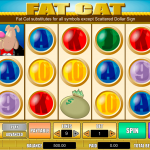 The scatter symbol is the dollar sign and if you land 3 or more you will receive 10 free spins. The good news here is that during the free spins round your wins will be a subject to a x 3 multiplier and it is also possible to re-trigger the feature. 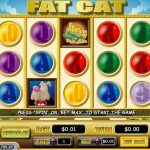 Fat Cat is a nice humorous video slot game. Nextgen Gaming used quite an unusual theme to create this game, but we have to say kudos for diversity. The game has everything we are looking for in an online slot. Nice graphics accompanied with nice sound effects and couple of special symbols and features to spice the things up. The betting options are also made that way that they can suit every players need. No matter what kind of a roller they are. For another great engaging game you should consider playing Fairies Forest a 5 reel slot by NextGen.